On Thursday 28th June, our teams of Cricketers (Thomas F, Samuel A, James G, Hayden M, Harvey D, Jasper V, Jasper R, Dan A and Sam C went to Trowbridge Cricket club to play in the county final. On our first match we played Sherston School and we lost a tight game by 11 runs. In our Second game we played Peatmoor School; we played a lot better and won by 21 runs. Our last match was against Woodborough School and we won again by 32 runs! Unfortunately, Sherston School, the team we played first, won all their games so we could not advance to the semi-finals. We had some star players – firstly Harvey made his debut with a magnificent catch. Then Thomas bowled two wickets in a row and on his third ball Samuel caught the batsman out – a hat-trick! Mr Tozer was very proud of our achievements! 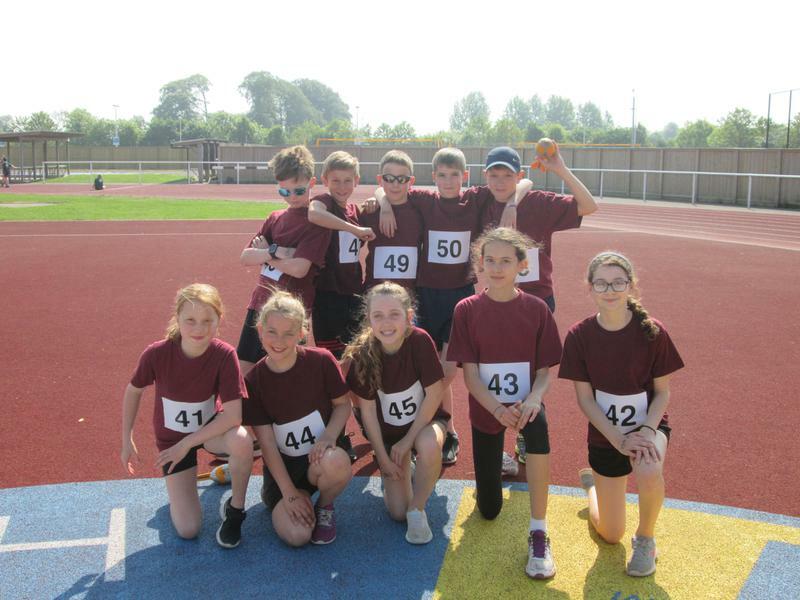 On Tuesday 26th June, Dylan A, Freja D, Thomas F, Olivia P, Jasper R, Seryn E, Rory H and Sophia P went up to St Laurence School and did a cluster athletics competition with Miss Blake. We did long distance, sprinting, standing long jump and throwing. On throwing, most of us beat our personal best – Dylan and Thomas were amongst some of the best throwers there. We all completed in a long distance race which was only 300 metres. We came 2nd overall by two points to Winsley. Written by Olivia P and Freja D.
On Tuesday 19th June, Fitzmaurice Primary School competed in the West Wilts Schools swimming gala held at Clarendon School. We really enjoyed the competition and everyone did amazingly well! We came second overall. The competitors were Jasper, Dan T, Dan A, Stanley, Clem, Evelyn, Niamh, Daisy M, Izzy, Harry, Alfie, Georgia, Lydia, Olivia, Tabitha, Mollie, Martha, Bethan, Thomas F, Thomas R, Sam A, Sam C and Louis. Year 3/4 came joint 1st place with Minister in their age group and Year 5/6 came 2nd in theirs. The Year 5/6 team will now attend the county finals on 4th July at Marlborough College. The first game we played was against Westwood and we beat them by a significant 33 runs. Our second match was against Stonar school. We beat them by 39 runs which was another great result. Our third and final group game was against Churchfields. The final score was in our favour as we won by 40 runs meaning that we had won our group and were in the semi-final. The semi-final was against Winsley. Fitz came out on top again winning by 50 big runs – we were into the final! In the final we played against Westwood, but it was a harder game and they played really well. We beat them however, so we were the champions! The whole team, Dylan, Louis, Thomas R, Thomas F, Noah, James, Jasper, Ollie and Samuel had a really good day and were happy that we won at the end of it. Our first event was the 75m sprint. We all did really well, but Noah was the only one who managed to come first. We also had lots of second places. There were eight people in each race. Our second event was the 600m long-distance race. Again we all did really well, getting three 1st place finishes (Dylan A, Louis W, Oliver C). We also had two 2nd place finishers (Thomas R, Noah V). The highest finish by the girls was Freja D who came 4th in her heat. Our penultimate event was the long jump which was really hard. We all jumped below our best except Louis who jumped a really good 1.94m. This was the record for the day at that point. Gabriella got the girls furthest with a jump of 1.78m. Our fourth and final event was the throwing. The score to beat was 39.42 by Winsley. We all threw really well with lots of people getting their personal records. Our furthest throw was by Oliver C – 37.60m, just missing out on the record for the day. It was a really great team effort, which was rewarded by first place out of 23 schools and over 1500 points. This means we will be going to the county finals at Marlborough College on 4th July, which we are all really looking forward to. On Wednesday 25th April, Miss Blake’s Gymnastics Club went to a competition at The Wiltshire School of Gymnastics. Over 18 schools took part, but only 3 could win a certificate. Two people performed a solo act but didn’t get judged as it was for fun. The first thing we were judged on was the floor routine and it was judged by a very kind judge. Next, we went on the vault. It was scary as we only had two goes and only our best one was the one that counted. After we did all of our activities, we found out our scores and the winners of the competition. Christchurch won with 75 points; 2nd place was The Grove and 3rd place was Hilperton. Fitzmaurice came 5th with 72.8 points. On 26th March 2018, 10 Fitzmaurice Primary School children went to a tag rugby tournament at Trowbridge Rugby Club. was made up of 10 people. In our first match we played The Mead, who eventually won our group. We lost the match 5-2 but played really well. they went on to win in the last minute. We lost the match 4-3. We won our next match 2-1 against Bitham Brook and our following match 3-2 against The Minster. We enjoyed the experience but were disappointed we didn’t get to the semi-finals. Written by Dylan and Louis. On Monday 12th March 2018, the Netball A Team went to the West Wilts Regional Finals at Kingdown School in Warminster. We qualified for this tournament after beating Winsley in the first round. We left at 2.45pm and began by doing a few drills. We sat out for the first match, then began the competition in match 2. All of our players kept on rotating positions and each player played one half of each game. The rain started during the last few matches we played. Sadly we did not win the tournament, as we were knocked out by Shaw School in the penultimate match we played. On Tuesday 27th February, Fitzmaurice Primary School held a Cluster Netball Tournament. Only Winsley came. They first played Fitzmaurice C and then Fitzmaurice B team. Winsley won both games. They then played Fitzmaurice A team and we won 8-4! It was cold and snowy but we kept rotating. Fitzmaurice A team beat the B team 5-0 and the C team 8-0. In the end it was Winsley and Fitzmaurice A team who were to go through to the next round which is on 12th March after school at Kingdown School. In the end the C Team came 4th, the B team came 3rd, Winsley came 2nd and the A team came 1st!!! from Miss Blake and the rest of Fitz to all those that took part. What a lot of medals won by our pupils – congratulations! On Tuesday 10th October, Fitzmaurice ran a cross country. I think the parents support really helped encourage all the children. It was two laps around St Laurence School. For the Year 3/4 girls, Skye P came 2nd and Niamh M came 3rd. Everyone did very well and the team came 1st overall. The Year 3/4 boys also did really well. Stanley L came 2nd and the team also came first overall. The year 5/6 girls ran it in a group. Freja D came 3rd and Sofia F came 4th with the team also coming in 1st overall. The year 5/6 boys had the race winner. Dylan A came 1st, Thomas R was 5th, Harry L 7th and Oliver C came 8th. Thomas F was the 1st year 5 boy home too. The whole school did really well this year and every child had fun. On Monday 16th October, we went to Stonar School to compete in another cross country event. Twenty-five schools took part with over 360 competitors in total. In the year 5/6 boys race, Dylan A came 2nd and we came 1st overall as a team. In the year 5/6 girls race we came 2nd as a team. In the year 3/4 boys race, Stanley L came 4th and we came 1st overall as a team. came 1st as a team. We did excellently as a school and we all enjoyed the experience – it was good fun. On Tuesday 10th October, the whole school took part in a sponsored burpee challenge. Each class took part in a fun 20 minute session during the school day, with the aim of each child doing around 30 burpees each. They were joined at 2.45 by parents and carers, to help them reach the whole school target of 10,000 burpees in total! Every penny raised from the Burpathon will go towards the refurbishments of our tennis courts, which is a huge project that requires over £80,000 worth of funding. Thank you to everyone who took part in this fundraising event and to Simon and Emma Beatson and Miss Blake for organising it. We smashed our target of 10,000 burpees with a grand total of 12604. Well done everyone! *UPDATE* After counting the sponsorship money, we have raised a fantastic £1387.35 !! 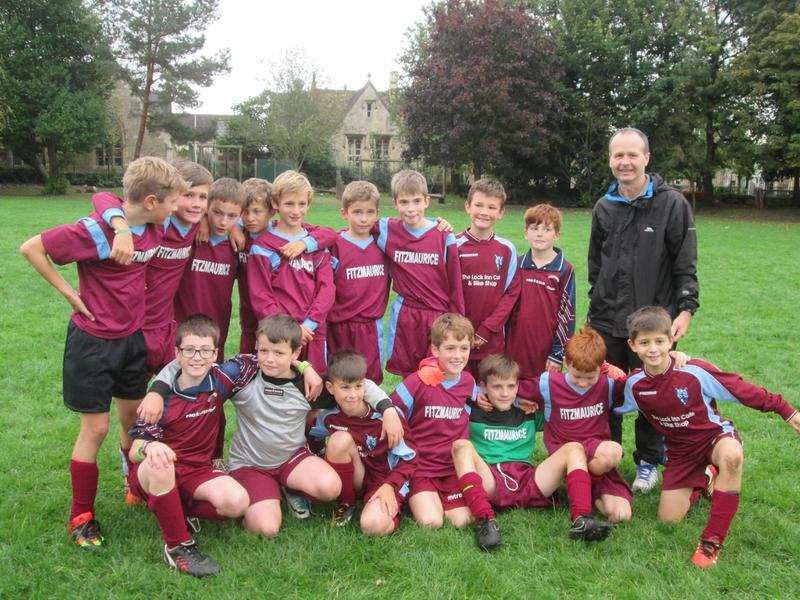 On Tuesday 3rd October, our school went to a football tournament at Christchurch School. We took two teams (an A team and a B team). In the A team there was: Thomas F, Dan A, Dylan A, Harry L, Noah V, Toby P, Jasper R, Jasper V, Thomas R and Louis W. In our first game we lost 2-0 to Churchfields. We played well but they beat us. In our second game we lost to Winsley. It was 2-0 again. However in our third game we won 2-0 against Christchurch B – Yippee! We had a rest then we were on again against Christchurch. We scored first but it finished 1-1. In the B team there was: Stanley W, Billy H, Clem N, Stanley L, Harvey D, James H, Hayden M, James G.
Their first game was lost to Christchurch A. A hard game to start with. The score was 3-0. The next game was against Christchurch B and they drew 0-0. Finally, they played Winsley and lost 2-0. Mr Tozer was pleased with the teamwork of both sides.